Although I used 8ply (DK) yarn, this pattern will allow you to experiment with any size, from 5ply (sport) to 10ply (worsted). 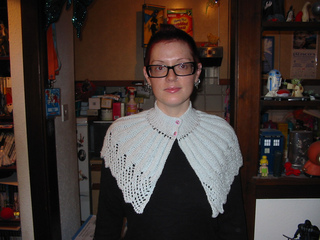 This pattern works with simple deceases and increases as the lace pattern and the cape is constructed from edge to edge (side to side) using short rows. It’s magic! 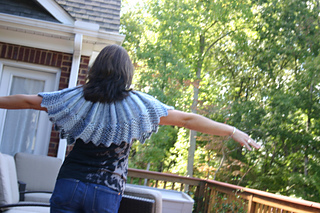 You can add length to the cape by extending the middle part. 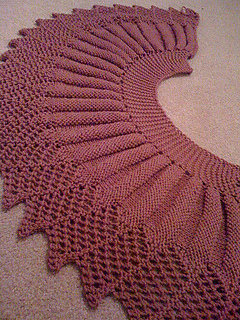 Many people have done more than the 25 repeats to make it bigger. It’s perfectly customisable like that. Use stitch markers to identify the beginning of the lace and the neck section (it helps). Feel free to make modifications & add your own flare. I loved seeing it with different colour and with beads.